This small sponge with the form of egg has just arrived to Spain after to have devastated among all the celebrities American. The certain thing is that is a very practical accessory that facilitates the best application of the base of makeup, that is to say the fundamental principle that offers to the skin a finished fresh and natural or all the contrary thing, type Venetian mask. The invention of color fushcia intense will not pass unnoticed neither around here. It created by Defendant Ann Forest and Veronica Lorenz, two of the make up artists more famous of Hollywood. With this esponjita you will obtain a had just natural makeup and uniform without abrupt changes of tone; small horror. The sponge aplicadora Beauty Blender improves the results of the makeup by its elliptic design, is manufactured without edges neither edges to avoid unaesthetic lines. An unlimited makeup rebranded neither edges without blurring, simply that itself be not noted. I do it with the fingers, but one must recognize that the idea is original, what I call a true news. It guarantees that arrives at all the corners of the face. The new esponjta washes with a cleaning one aromatizado with lavender and free of colors or irritating products to maintain it always in perfect conditions of hygiene. Price: 19.50 euro. It is sold with a Blendercleanser, 19 euro. Starter Kit: Beauty Blender + Blendercleanser, 36 euro. And already you know after making up touches always desmaquillar well the skin and to put a little moisturizing. We have something in common with celebrities like Beyonce, P. Diddy and Alicia Silverstone: We love the Beauty Blender and you will too. The pink sponge is by the far the most amazing beauty tool I have been introduced to. It really does deserve all the hype, and the cute packaging has been getting the attention of many. With her product, Rea Ann Silva shares the secret of how the beauty blender helps applying make-up so effortless. Before actually using the egg shaped sponge, I took a look at a few tutorials. The lessons were well worth it. Moistening the egg causes it to expand and have a bounce effect when dabbed on the skin to give it a non-streak finish. The dampness allows the make-up to actually stay on the skin. I thought it would only work with creamy products, which I am not fond of. The blender is phenomenal and works with blush, bronzer and loose powder. So why the egg shape? The cornered end makes it so much easier to apply concealer while the rounded edge helps blend make-up into the jaw line and cheeks with a barely there finish. Compared to my brushes which are my absolute favorites for applying make-up, the beauty blender was able to do so much more in less amount of time. The beauty blender should be a part of you make-up application process. You will not regret it. The sponge is re-washable. It comes with its very own cleansing soap and can be sent back to the company to be recycled – not bad for taking care of the earth and staying beautiful at the same time. Spoiled Pretty is partnering with Beautyblender for a giveaway. Two lucky readers will win the Hot Pink Holiday gift set ($23.95), which includes Beautyblender and 3 oz Blendercleanser in an organza drawstring carry pouch. For those of you not yet familiar with the Beauty Blender, I can tell you that it really does a fantastic job when it comes to the precision of applying your foundation. This sponge was invented by two Hollywood makeup artists and it not only reaches all of the harder to reach areas on your face, but it also gives your skin the look of being airbrushed. There is also a fabulous lightly scented lavender cleanser that is free of any dyes and skin irritants. Let me speak frankly. If you’re applying your foundation with anything but the Beautyblendersponge, you’re doing it wrong. Look…I don’t mean to put you on blast, but I’m here to give it to you straight. And when I tell you that Beautyblender is, hands down, the best foundation applicator, I speak the truth. The point of foundation is to fool the eye of the beholder into thinking you were blessed with a flawless complexion. But if you’re applying it incorrectly, or with inferior tools, you just look like you’re wearing a makeup mask. And who wants that? Nobody, that’s who. The difference between foundation that looks like foundation and foundation that looks like skin is Beautyblender. Since I was introduced to Beautyblender in 2007, we have been in a monogamous relationship. It is the only tool I use to apply my foundation. Invented by Hollywood makeup artists, this sponge leaves you with a professional finish. Applying makeup with fingers or sharp-edged triangular sponges can waste makeup and can leave visible streaks. Beautyblender’s elliptical shape makes allows you to access hard-to-reach areas with ease. Its suede-like texture repels product, so your foundation actually ends up on your face – rather than absorbed by the sponge. And its unique curves fit the contours of your face, leaving your makeup dazzling and undetectable. I even use it to apply my concealer and cream blushes. And if you have problem skin, I can’t recommend anything better for magically disguising blemishes and hyperpigmentation. Beautyblender is reusable (perfect for those green gals), latex-free, non-allergenic, and odor free…and makes a great holiday gift. Give your beauty-loving BFF the gift of perfect skin with the Hot Pink Holiday Kit, which includes Beautyblender and 3 oz Blendercleanser in an organza drawstring carry pouch….tagged for gift giving! You know who is also a fan of Beautyblender? My pal, and Celebrity Makeup Artist, Mario Dedivanovic. Watch the Beautyblender in action, as Mario makes up the beautiful face of his muse, Kim Kardashian. I love finding cool makeup tools that make application easier. And when its good for the environment? Well, that’s even better! So of course I LOVE the Beautyblender makeup sponge (blender and cleanser is $34.95). The pre=”The “>Beautylender is an egg-shaped (elliptical), velvety sponge that because of the shape, blends with out streaking. Stippling it around the face creates a smooth surface and even helps my pores seem smaller. The pointed side is for around eyes, mouth and nose and the base is for broader areas like forehead, cheeks and chin. I clean it after each use by applying a small amount to the soiled areas of the Beautyblender. I lather, then rinse. When it is wet, it is twice the normal size. I then place it on the pedestal on the top of the cleanser and let it air dry. Even if you use it a little wet, it still works great! To learn more and to purchase the Beautyblender, visit www.beautyblender.net. Have fun with this great product! There isn’t a woman in the world who doesn’t strive for a poreless complexion. If she claims she could care less, she is lying. While genetics play a crucial factor in who gets blessed with beautiful skin, many of us are forced to fake it. Apparently, it’s all about the sponge — the makeup sponge. Rea Ann Silva and Veronica Lorenz are two highly sought-after celebrity makeup artists. They met on the sets at Paramount Studios in Hollywood and, after years of being consulted by their celeb clients about achieving the flawless finish at home, the two ladies decided to let the cat out of the bag. Up to this point, makeup artists had been cutting triangular sponges into round, edgeless shapes to achieve a more seamless blend. Rea Ann and Veronica decided to put their collective beauty expertise together and thus, Beautyblender was born. This bubble gum pink elliptically-shaped sponge with rounded curves (one side has a large tip, the other is a small tip) is the go-to product for an even and clean makeup application. And the buck doesn’t stop there. Beautyblender isn’t merely just a foundation sponge. It’s multifunctional — like a friend with benefits. Use it to apply self tanning lotion without the streaks and acne spot treatments or create that smokey eye effect by smudging shadows and liner with the smaller tip end. Under eye circles? No problem, the smaller tipped side will take care of that while the round side effortlessly and flawlessly pats on foundation AND powder! Everyone, from Gwen Stefani and Beyonce to Sela Ward and Tyra Banks, is a fan of the cult-favorite, Beautyblender. And why? Well, celebrity stature doesn’t ensure anyone a flawless complexion. Pimples and wrinkles don’t discriminate. I’m officially obsessed. Arrived in Spain’s revolutionary elliptical sponge Rea Ann Silva and Veronica Lorenz. Adored by makeup artists in the U.S., this beauty has an elliptical shape tool that provides a professional finish. Just arrived in Spain Beautyblender, the revolutionary makeup sponge with elliptical shape that has caused rage among make up artists in America. Dissatisfied with the makeup application with fingers or sponge traditional, Rea Ann and Veronica Lorenz Beautyblender created the waste in order of least amount of product and get a flawless result, almost professional. This beauty tool, which allows disguise even the most difficult areas can be used with foundation, concealer, powder, the blush, shadows and even self tanning and lotions. With no corners or edges, prevents the formation of stripes, as unnatural. The sponge can be used both dry and wet, while the second case we obtain more satisfactory results. Latex is hypoallergenic and odorless. The range consists of the sponge Beautyblender (19.50 €), lotion Blendercleanser – a cleanser for the sponge, scented with lavender and free of irritants (19 € for 180 ml format) – and two sets: the Starter Kit ( sponge and lotion 150ml, € 36) and the Duo Kit (two sponges and lotion 150ml, € 45). All Beautyblender products are available exclusively on If perfume until January 2010. In February will be available in drugstores and on the web targeted http://www.2artbeauty.com. Blend, blend, blend is the mantra of many a professional make-up artist and this elliptical sponge is perfect for foolproof foundation application. With no hard edges, the blender eliminates lines and streaks for a finish that’s far more refined than you’d achieve with your fingers. 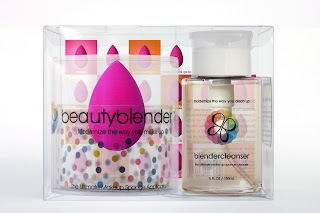 You are currently browsing the Beautyblender's Blog blog archives for November, 2009.